I’ve written extensively about how Payment Cards implement the “pull model”. When you want to pay for something, you hand over your card details to the merchant and then hope that those details don’t get into the wrong hands as they pass from merchant to their acquirer to the switch and finally to the bank that issued the card in the first place. In particular, the big problem is what happens when companies with millions of cards on file get hacked. Think of major online retailers who save your card details for you. It’s very convenient for you but it only works because they’ve stored your card details on their servers. If they get hacked, then millions of people are at risk of theft and card issuers will have to reissue millions of new cards. It’s a huge pain. When you enter your card details on a merchant’s website for the first time and tick the “save my details for next time” button, the merchant doesn’t store your card details right way. Instead, they send the details to their merchant acquirer – e.g. Elavon – and ask them to issue a token. The acquirer creates a random number that might look like a credit card number in some cases – the token – and returns it to the merchant. The acquirer records all this information in its own database (i.e. the real card details, the token they issued and which merchant they issued the token to, etc). The merchant stores only the token in their database, not the real card number. Now, next time you try to buy something from that merchant, they send the token they’ve stored to the acquirer. 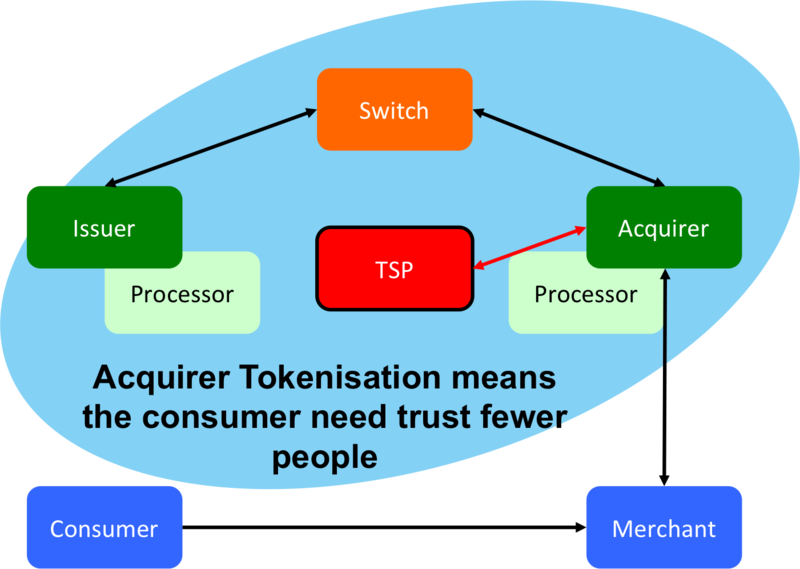 The acquirer checks that the token is valid and that it came from the right merchant. And, if so, they convert it back to the real card number and process the transaction as normal. The really important point here is that we no longer really care as much about the merchant’s security. If they get hacked, it’s not as much of a problem: the tokens are useless to anybody else. The acquirer will only accept them if they’re presented by the original merchant. If the hacker tries to use them somewhere else, they simply won’t work. And this is nothing new. Acquirers have offered this service for ages for merchants who wanted to use it. 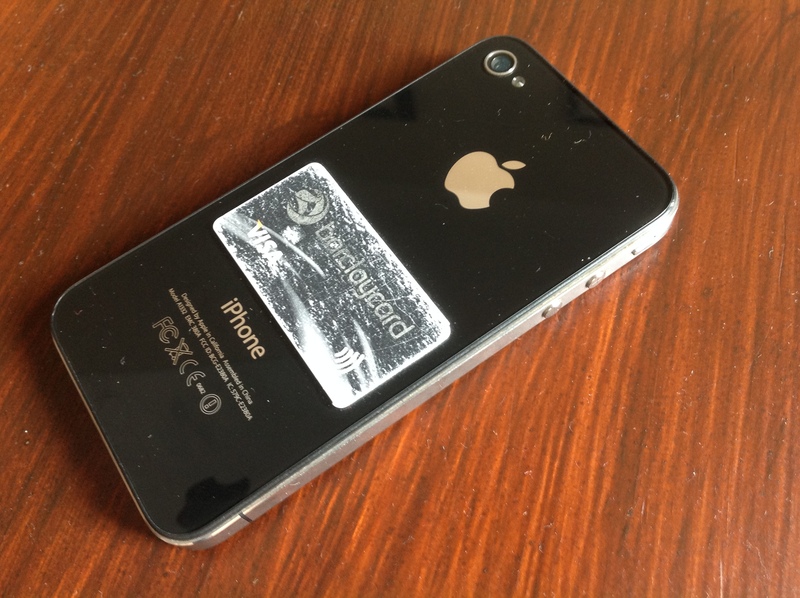 Now think about Apple Pay and think about the challenges Apple faced in getting this to work. Here’s how contactless payments are supposed to work when you pay for goods in store: the cashier rings up the price and activates the contactless pad so you can pay. You tap your contactless card and you’re done. This piece is completely normal: anybody with a contactless (“PayWave” or “PayPass”) card can do that today. It’s what I’ve done with the PayTag on my iPhone 4 for ages. But how do you get a phone to pretend to be a contactless card? Well that’s a solved problem too. Android devices have done it in various ways for years, for example. So what’s the problem? The answer is: security. Sure… you can put somebody’s card details into the “Secure Element” of a phone (or do something clever with Host Card Emulation) but if you’re putting the real card number in there then you face all the same risks a merchant faces… if somebody were to figure out how to hack into your system, you’ve got a big problem on your hands… And in Apple’s case, imagine if almost 1 billion payment cards were compromised! So it would be much safer if you stored a token on the phone, rather than the card details themselves. That way, if the system is broken, you can just invalidate all the Apple tokens and you’re done. How does a firm like Apple get the tokens? Remember: they want to emulate a contactless card so that the customer can use the phone to pay at a merchant. 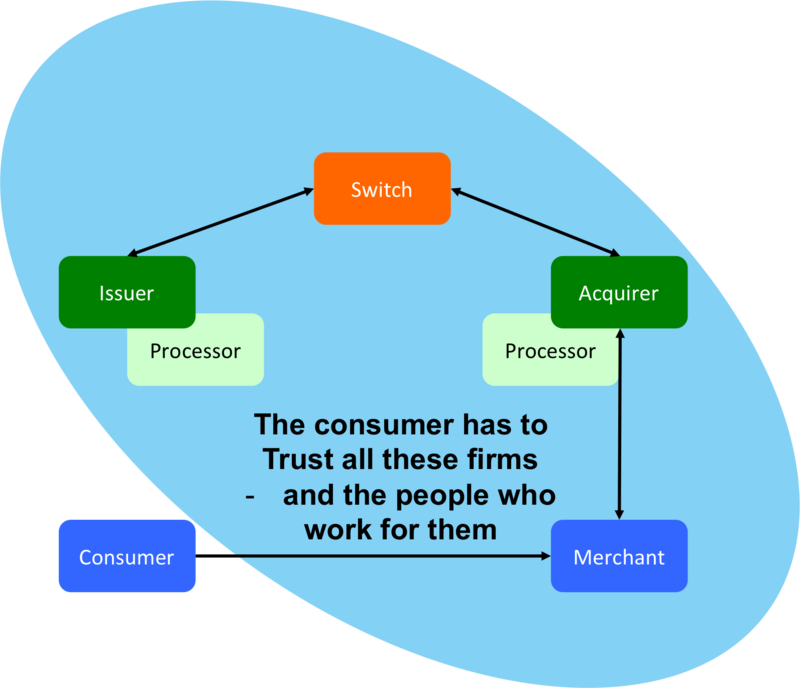 You don’t know which merchant acquirer any given merchant uses so an acquirer-specific token is useless! And this is where the EMVCo spec comes in. In short, the EMVCo spec proposes is that tokenization be standardized and it implies strongly that it should be the schemes (or maybe issuers) who perform the work, not the acquirers. 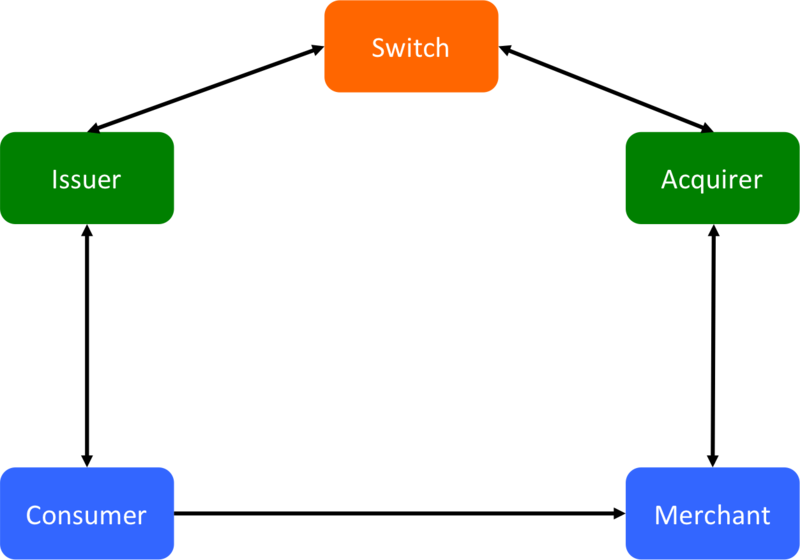 I scratched my head at first… apart from perhaps being a power grab, why would anybody bother change this simple model? Imagine you were trying to build something like Apple Pay. This is exactly what you would need. You’re faced with consumers with cards from thousands of issuers and you want to create tokens that can be processed by merchants who use one of tens of acquirers. You need a system that gives you a token that all acquirers can process and which the schemes can route to the right issuers… it makes sense that it be the schemes who provide such a services. Indeed, Visa Inc have written about their service here. And so I think that’s what’s going on. 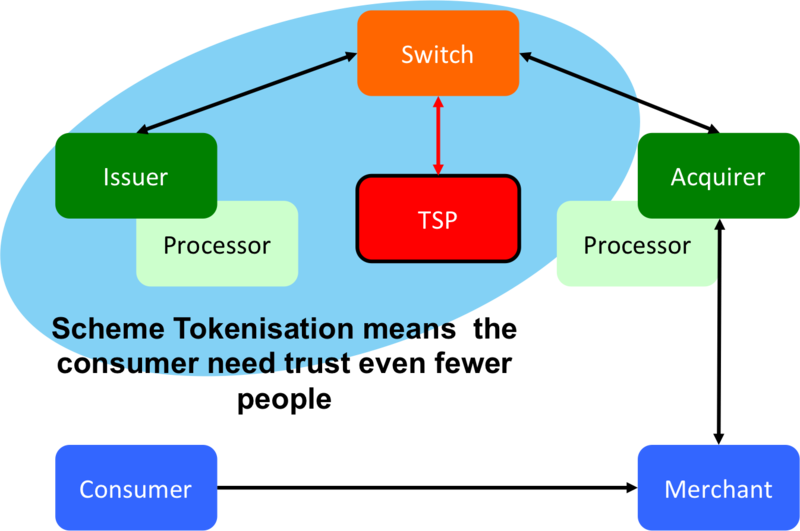 Apple is acting as a “Token Requestor” in the EMVCo model. When you enter your card details or take a picture of your card with your iPhone 6, Apple will call the Token Service for the appropriate network – let’s assume Visa. Visa will check the details (maybe your postal code, CVV2, etc) and perhaps authorize with the issuer. And Visa will then issue Apple with a token. This token will only work for contactless payments and it will be associated with Apple so it can be revoked in the event of a problem. But it will look just like an ordinary card number so acquirers will be able to process it without even realizing it’s a token. And it’s this token that will be stored on the phone’s secure element and passed to merchants every time you use it. So, in many ways, Apple Pay could turn out to be astonishingly standard-compliant. It relies on schemes having Token Service Providers up and running so don’t expect it to roll out everywhere, for all schemes, any time soon. But notice how much leverage it gives them over issuers. It would be easy to refuse to include an issuer’s cards on the platform unless the issuer pays up. That has the interesting property that deals could be done on a case-by-case basis and different issuers may have different deals. This is, of course, just my analysis from public information. I have no inside knowledge and I could be completely wrong. In particular, I’m struggling to reconcile my analysis with some claims that Apple Pay will use a different token for every purchase. I don’t understand how that would work, unless we assume the phone is online at point of purchase? Anybody know for sure? Am I way off the mark? Regular readers will know that I am extremely optimistic about the long-term potential of Bitcoin and cryptocurrency technology to revolutionise the financial system. But that doesn’t mean I think they will overturn all aspects of the system. In particular, I am skeptical of claims that Bitcoin will have a meaningful impact on retail payments and break the stranglehold of the payment card companies. Of course, many people disagree with me. Articles such as this one from last year are typical of the genre: “credit card companies” are accused of charging obscenely high fees, hindering innovation and being ripe for disruption. Payment Cards fees might seem expensive but does it mean they are vulnerable to disruption? Now, it’s true that the fees do seem expensive at first glance but, as David Evans has argued, it’s not obvious that the Bitcoin payment processors are really that much cheaper, once you take into account their spreads and the costs of getting into and out of Bitcoin at each end. But the main reason I think the incumbents are in such a strong position is because the industry has extremely strong network effects, which leads to formidable barriers to entry. Would-be Bitcoin entrepreneurs need to understand this structure if they are to succeed. When you step back and think about it, the modern payment card industry is a marvel – an underappreciated, underrated miracle of contemporary commerce: you can travel to any corner of the earth, armed only with a piece of plastic bearing the Visa or Mastercard logo. It’s a minor miracle. But when you look at the businesses of the major card brands, they turn out to be really, really strange companies. They simply don’t do what most of us think they do. Take a card out of your pocket… chances are, it will be a Visa or Mastercard, or maybe UnionPay if you’re one of my Chinese readers. Let’s assume it’s a Visa card for now. And we’ll worry about American Express later, because they’re different to all the rest. 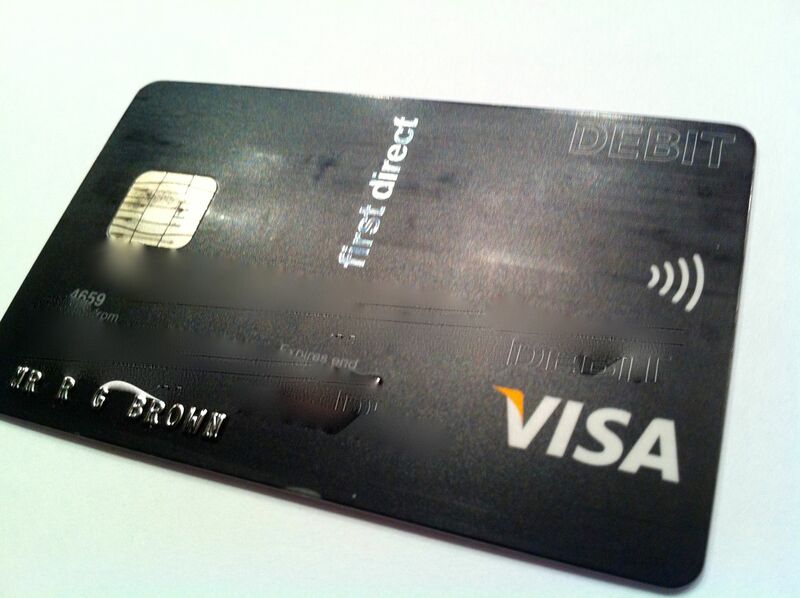 A Visa debit card, issued by first direct bank. Notice something strange. There are two brands on the card. There is the Visa logo and there is one for first direct, the division of HSBC with whom I hold my current account. Most other consumer products don’t have two firms’ logos on them. Something strange is going on. Now, it it was first direct that issued the card to me, not Visa. And it’s first direct I would call if something went wrong, not Visa. I don’t have any relationship with Visa at all. There’s no Visa call centre I can call if I have a problem with my card and there’s no Visa app on my phone. This is strange: a hugely powerful global brand and yet the billions of consumers who use it don’t have a relationship with them. It gets stranger. Another little-known fact is that no retailer anywhere in the world has a relationship with Visa either! So we have one of the world’s most recognizable brands and nobody who uses their “product” has any relationship with them. It’s worth thinking through why this might be and why it is such a powerful model. How would you build a credit card system if you were doing it from scratch? Imagine you run a bank in a world before credit cards. Wouldn’t it be great if your customers could go to local shops and “charge” their purchases to an account that you hold for them? You could make money offering credit to the customers and make some more money charging the merchants for providing this service. 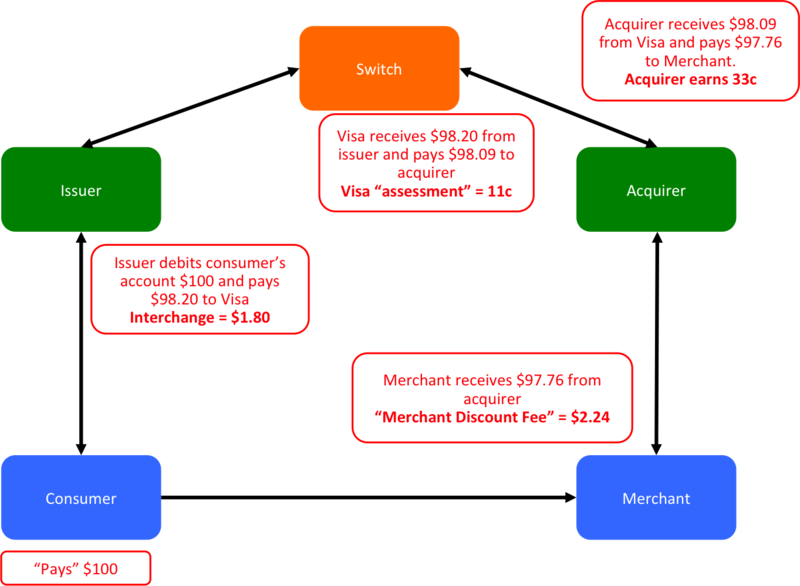 You would end up with the situation in the diagram below: a merchant who banked with Bank B wouldn’t accept cards issued by Bank A. Why would they? They had no relationship with Bank A and who’s to say cards from Bank A would even work with their machines?! Why would cards issued by Bank A be accepted by a merchant who uses Bank B if Bank A and Bank B operate competing schemes? If you were running one of the banks, how might you respond to this problem? One answer might be to view this as an arms race: perhaps the best strategy is for banks to enter an all-out war… sign up as many merchants as they can… sign up as many customers as they can and bet that you’ll be the last firm standing when the industry shakes out. Obvious problem: it would be ruinously expensive and what happens if it ends in stalemate? You still have the same problem. A flash of insight – who are you really competing with? Let’s recap: you’re a bank executive trying to build a payment card business. But your competitors are all trying to do the same and it’s going to end in tears: you’ll confuse the merchants with hundreds of different card types or you’ll go bankrupt trying to be “last man standing”. It feels like having other banks accept your cards at their merchants would be good… but how to make it work? And this is where a flash of insight changed the world. Somebody realized that the cards “business” was actually two businesses. The first business is all about offering credit to your customers, managing their accounts and processing their payments. We could call this card issuing. And the second business is all about enabling merchants to accept card payments and get reimbursed. We could call this merchant acquiring. Aside: we call it “acquiring” because it’s helpful to model the card payment as a receivable that the processor purchases (acquires) from the merchant at a small discount, which you can think of as the processing fee. This is the key point: issuing and acquiring are totally different businesses which don’t compete with each other. Sure… all the issuers compete with each other. And all the acquirers compete with each other. But the issuers don’t compete with the acquirers. Indeed, they have a really strong incentive to co-operate… the issuers want all the acquirers to accept their cards… and the acquirers want to offer their merchants the ability to accept as many cards as possible. So let’s imagine a group of issuers teamed up with a group of acquirers. And imagine they agreed that the acquirers would all process the cards of all the issuers in the group: every issuer’s card would be accepted by every acquirer. They could use this forum to hammer out some standards: they would agree a common way to process cards, timescales for reimbursement, rules for what happens if something goes wrong… they’d define a “scheme”. Now… this scheme would need two things: consumer recognition and merchant recognition. Consumers would need to know their card would be accepted at a participating merchant. And participating merchants would need to know a given card was part of the scheme. So we need a brand. This brand would be something you could put on the cards and place in the shop window. It is how a merchant would know an issuer’s card was part of this scheme and it is how card holders would know a merchant was able to accept cards from that scheme. One of these schemes is, of course, Visa. Another is Mastercard. And so on. And this is why cards carry two brands…. One to identify the issuer and one to identify the scheme. In this way, the card schemes have created a system that allows merchants, who only have a relationship with their own bank, to accept payment cards issued by hundreds of other banks, without having to have any relationship with those banks at all. The only thing that matters to them is that the issuer’s card is issued on the relevant scheme. 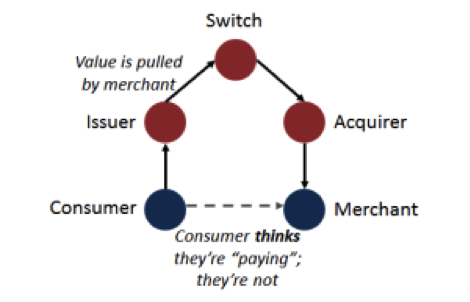 And this model has really strong network effects… the more issuers and acquirers in the scheme, the more useful the scheme is to card holders and merchants. It’s self-reinforcing. Talk is cheap… how does it work in practice? OK. So we have a paper agreement that says an acquiring bank will accept any valid transaction made with a Visa-badged card. But how? How do they get approval from the issuer for the transaction? How do they get reimbursed? How does it work in reality? Do all members of a scheme have to have a relationship with every other member so they can route the transaction to them for payment? That would be expensive and error-prone. So this is where the scheme re-enters the picture. In addition to maintaining a powerful brand and setting the rules, they also run a switch: the merchant acquirers send all their Visa transactions to Visa itself… and Visa then forwards them on to the appropriate issuer. Similarly for Mastercard and the other schemes. So we end up with a hub-and-spoke model… with Visa at the centre. (And Mastercard and Union Pay and so forth). And this is why Visa’s “customers” are the issuing and acquiring banks… not end-consumers… Visa exists so that issuers can receive broad acceptance of their cards… and so that merchants can, in turn, offer broad acceptance. But the schemes depend on consumer recognition – hence why they spend so much money advertising to consumers, even though the consumers are not their customers. 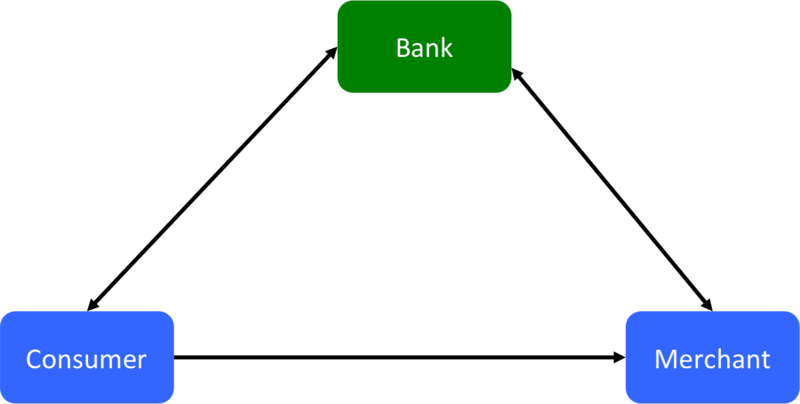 Notice something really important: this is a pull system… the reason you need all this infrastructure is because your card information has to get all the way from the terminal in the merchant back to the issuer so the issuer can pull the money from your account and send it back to the merchant. By contrast, Bitcoin is a push system: once you know the merchant’s “account” details, you can just push the payment to them. So why do you need all these intermediaries? If you were a Bitcoin payment firm trying to break into the retail market, perhaps that’s where you’d start? After all, it’s true that most of the payment card infrastructure simply isn’t needed in the Bitcoin world. Think about what Visa and Mastercard have achieved: they offer global acceptance and predictable behavior. Wherever you are in the world, you can be pretty sure somebody will accept your card and you know how it will work and that there is a well-understood process when things go wrong. This offer is powerful. Ask yourself: if you could only take one payment instrument with you on a round-the-world trip, what would it be? If you couldn’t stake a stack of dollar bills, I suspect you’d opt for a credit card. And this predictability – a consequence of the rulebook – is important: consumers enjoy considerable protections when they use a major payment card. 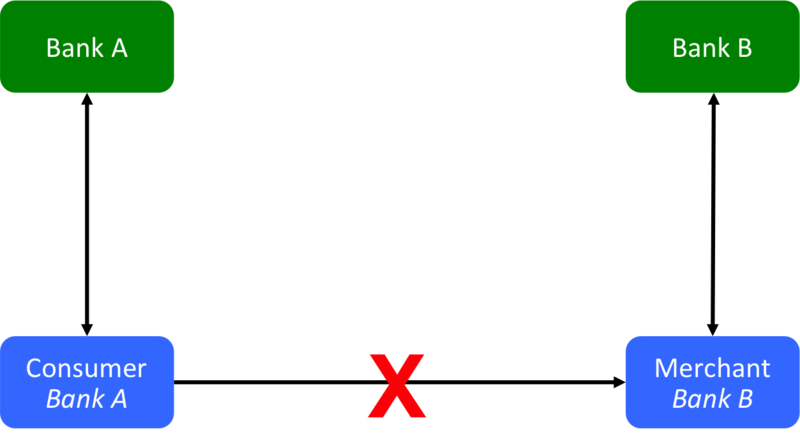 They can dispute transactions and, in some countries, their (credit) card issuer is jointly liable for failures of a merchant. Consumers like to be nannied… even if they have to pay for the privilege! So for those who aspire to overturn the incumbents, you need a strategy for how you will become the consumer’s “default” or preferred payment mechanism. American Express has achieved this through a joint strategy of having large corporates mandate its use for business expenses and offering generous loyalty benefits to consumers… they effectively pay their customers to use their cards. PayPal has achieved it through making the payment experience easier – but note, even here, many PayPal payments are fulfilled by a credit card account! And this is why I harbor doubts about whether Bitcoin will become a mainstream retail payments mechanism, at least in the major markets… why would a consumer prefer it over their card? Perhaps the openness and possible resistance to card suspension/censorship will attract sufficient users. But it’s not obvious. I know this account would scandalize a historian but that’s OK: It’s not intended to be historically accurate… the idea is to share intuition on why things are the way they are. I’ve ignored the “three-party” schemes like American Express. I’ve also ignored fee structures and the importance of interchange. Ten dollars in your pocket is not the same as ten dollars in the bank and neither are the same as a ten dollar credit on your electric bill or the ten dollars your friend owes you. Ripple is simply a manifestation of this insight. I spent a couple of hours at the Startupbootcamp Fintechathon last weekend. I was there to share ideas on what types of finance problem are a good fit for block chain solutions – and which ones might be best solved using other techniques. When I arrived, the audience were deep in videoconference with Ryan Terribilini of Ripple Labs. I thought he did a great job of answering their questions about Ripple and I decided it was time I finally tried to get my head around it. Not all dollar, euro and sterling liabilities are the same. And Ripple is nothing more than a platform that makes this insight explicit. Perhaps the most important thing we need to realise about bank deposits is that they are liabilities. When you pay money into a bank, you don’t really have a deposit… you have lent that money to the bank. They owe it to you. It becomes one of their liabilities. That’s why we say our accounts are in credit: we have extended credit to the bank. Similarly, if you are overdrawn and owe money to the bank, that becomes your liability and their asset. I then explained how the payment system is really little more than a bunch of systems for transferring these obligations around. Where Ripple encourages us to think more deeply is about whose obligations they are. Imagine I owe my friend Bob £50 and that we are both customers of Barclays bank. When it’s time for me to pay him back, I instruct a “transfer” online. I tell the bank to reduce what they owe me by £50 and increase what they owe to Bob by £50. The bank remains flat… the only difference is to whom they owe the money. This is the same story I told in my piece about the payments system. Before the transfer, I owed £50 to Bob. After the transfer, the bank owes £50 to Bob. Bob still doesn’t have the £50 in his hand… all that’s happened is that somebody else now owes him the money. But this is just fine for Bob…. He trusted me to owe him the money and he also trusts his bank to owe it to him. Bob previously had a £50 “asset” issued by Richard. Now he has a £50 asset issued by Barclays. Richard’s debt to Bob is settled and Bob is happy. OK – so that’s obvious, perhaps. But notice how it only worked because Bob trusted both me and the bank. And also notice that he doesn’t trust us in the same way. He’d probably be quite happy to have thousands of pounds in his bank account. I suspect he’d be very uncomfortable lending me more than £50. Not all dollar, euro or sterling asset deposits are the same! It matters who issues them. It is highly likely that Bob prefers to be owed money by his bank than by me. £50 owed by me is not the same as £50 owed by the bank. And this is the Ripple insight. Imagine now that the situation is a little more complicated. Bob and I are sitting in a café. I don’t have any cash and Bob can’t remember his account details. How am I going to pay him? A Barclays transfer isn’t going to work. Out of the corner of my eye, I see that the café sells prepaid debit cards. Excellent! I use my own debit card to buy a £50 prepaid debit card and hand it to Bob. My debt is settled, right? What makes me think Bob would be happy to accept a prepaid debit card from an issuer he’s never heard of? Are they insured? What happens if they go bust before he can spend the cash? £50 on a prepaid debit card is not the same as £50 in cash or a £50 IOU from a friend or £50 owed by Barclays bank. And it is Bob’s choice whether to trust that card. It turns out that Bob doesn’t trust this card… So we have a problem. I don’t have his bank account details and he won’t accept a prepaid debit card. How am I going to pay him? Conveniently for my story, it just so happens that my friend Carol is sitting at the table next to us. Bob doesn’t know Carol so I introduce them to each other. How can Richard pay Bob when there are no issuers of pound sterling that Bob trusts that Richard is able to use? 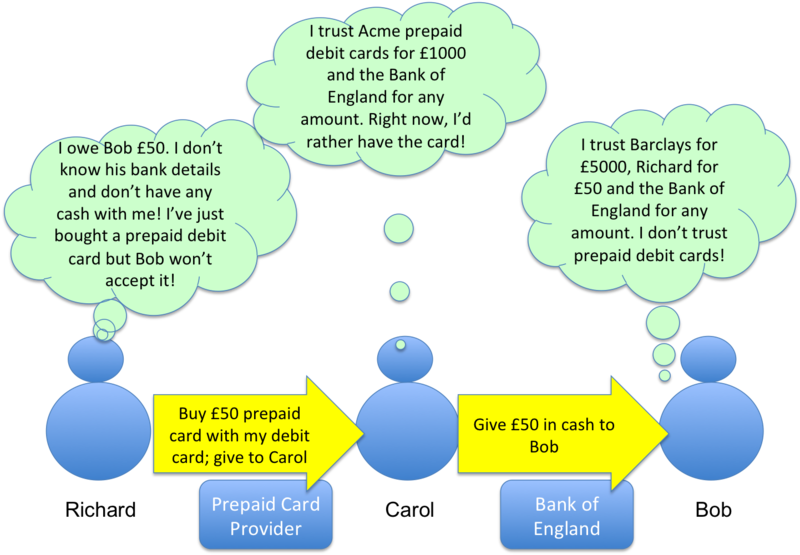 Here’s what we could do: I could give Carol the prepaid debit card (she needs something she can use online and the £50 balance is well below the £1000 limit that she is willing to trust the card company for) and she can then give the £50 in cash to Bob. Bob is happy to take the cash: he also trusts the Bank of England, the issuer of the notes. Great: Bob now has £50 issued by somebody he trusts. I’ve managed to pay Bob what I owe him by enlisting the help of a prepaid debit card provider and Carol… even though Bob didn’t trust the prepaid debit card and he doesn’t even know Carol. Richard can pay Bob by “rippling” his transaction through multiple issuers and intermediaries, finding a route of trust that wouldn’t have been possible otherwise. Yes, yes, I know…. It’s an utterly contrived example. But it makes the point: not all pounds, dollars and euros are the same. It all depends on the issuer: when we open a bank account in the UK, we’re saying we trust that bank to issue GBP liabilities to us. When we lend £50 to a friend, we’re saying we trust that friend to issue GBP IOUs. And we all trust different groups of issuers and to different extents. So how does this relate to Ripple? The answer is that Ripple is a general purpose ledger and payment network based on the key insight that when you try to pay somebody, it’s only going to work if they end up with an asset that was issued by an issuer they trust. In our case, Bob trusted me, he trusted Barclays and he trusted the Bank of England. 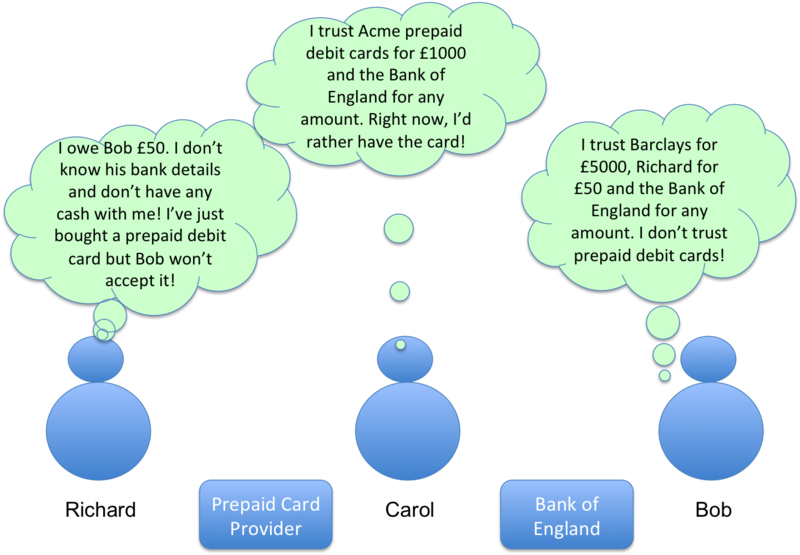 But he didn’t trust the prepaid debit provider and he doesn’t trust Carol – so a £50 balance issued by the prepaid debit card provider was never going to satisfy Bob. But, because Carol and I both trusted the prepaid debit provider and both Carol and Bob trusted the Bank of England – and Carol actually had some notes issued by the Bank of England in her purse – I was able to settle my debt to Bob by routing it through the prepaid debit card provider and through Carol. The lesson of all this is that if you’re going to build a system that represents real-world currency balances and make payments between them, you really need to think about who issues those balances. And once you get this point, the point of Ripple becomes clear: it’s a way for one person to hold funds issued by issuers he or she trusts – and to pay anybody else by transforming those funds into balances issued by issuers that the recipient trusts. Sure – there’s more to it than that…. But once you get the idea that any individual participant will only trust balances issued by certain issuers, the whole point and design of the network becomes clear. The example in this post feels contrived, because it is. But imagine you’re a major bank. 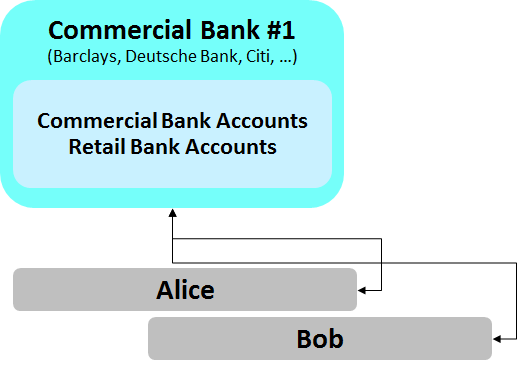 You have precisely this problem: you have correspondent banking arrangements around the world. You have separately capitalised and regulated subsidiaries around the world. And you need to make payments to people and firms all over the world on behalf of yourself and on behalf of your customers. You need to keep track of balances issued by hundreds of legal entities around the world and need to instruct transfers and exchanges thousands of times per day. Today, you do this through correspondent banking arrangements, the SWIFT network and multiple other intermediaries and communication platforms. If I understand the vision correctly, Ripple sees itself as a universal, distributed ledger for simplifying and rationalising this complicated landscape. Will it work? Will the banks and major firms adopt it? Who knows. But the underlying insight is deep and it feels like they’ve figured out something that is important. It amuses me when I see Bitcoin and Ripple discussed in the same context because, for me, they’re completely different. The core of Bitcoin is all about building a trust-free decentralized transaction ledger for tracking the ownership and transfer of scarce tokens – Bitcoins. And the whole point of Bitcoins is that they are counterparty-risk-free assets: my Bitcoin is not somebody else’s liability. By contrast, Ripple is all about dealing with assets that are somebody else’s liability. 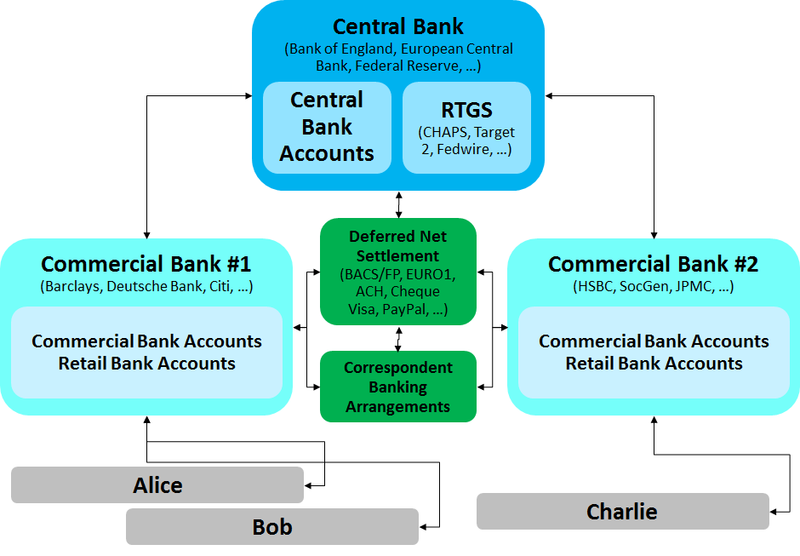 So the focus in Ripple is on representing liabilities issued by identifiable issuers and enabling them to be transferred between individuals on a network. They share some similarities but they’re not the same thing at all.